Former Massachusetts Gov. 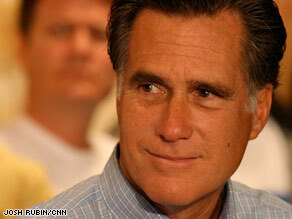 Mitt Romney says Republicans must lead the American Revolution. ARLINGTON, Virginia (CNN) - Three prominent GOP leaders kicked off a campaign Saturday to reshape their party's image, gathering at a restaurant in Northern Virginia for the first of a series of town hall meetings. The goal of the initiative, called the National Council for a New America, is to connect Republican leaders with voters across the country to help get the party's electoral fortunes back on track. "Certainly our party has taken its licks the last few cycles, but that's why we're here," said House Minority Whip Eric Cantor. "The reality is the prescriptions coming out of Washington right now are not reflective of the mainstream of this country." "It's time for us to listen a little bit, learn a little bit," said former Florida Gov. Jeb Bush, who advised Republicans to work on the party's message and "not be so nostalgic." "I would say you can't beat something with nothing. The other side has something. I don't like it, but they have it," said Bush, who repeatedly praised President Obama's tactical approach to politics, and commended his 2008 campaign as "forward-looking." He blamed Washington for setting in motion policies that led to the collapse of the housing market, and painted his party's current minority status as a boon. "We have an advantage," said the former Republican presidential candidate. "When a party has the White House, communication comes [from the] top down, and there's a strategy that everyone has to march behind." Instead, he said, the GOP had the option of drawing its strategy from the grassroots. "We don't have to come up with all the answers today. Thank goodness, we have a little time," he said. "Certainly by 2010, we better." The venue - a packed pizzeria in an Arlington strip mall - had the feel of a small-town campaign stop Saturday morning, with a supportive crowd tossing friendly questions at the panel. But outside the front doors of the establishment were twin reminders of the challenges facing the party. The parking lot out front, even with the heavily Republican crowd inside, was dotted with Obama bumper stickers. Northern Virginia has shifted solidly Democratic in recent elections, and surrogates for John McCain's campaign made a series of statements late in the race that acknowledged the party had all but conceded the area. Name Only - and urging them to push for stricter immigration enforcement. McCain is prominently featured in materials for the new group. Health care, education and small business growth were all major topics of discussion Saturday - but immigration was one entry on a long list of potentially divisive social issues that went unmentioned. significant part of the party's base. "Any topic will be included in the national dialogue," he said. "There are no limits." Putting a silk hat on a pig doesnt change the fact that it is and always wil be a (believe or not) pig. It's probably too late now but the Republicans did have a great chance after the inauguration to get back into the good graces of the public and at least appear that they cared more about the people than their own re-elections. Instead of yelling, blustering and throwing down copies of the stimulus they could have admitted that the Democrats did take out many things and added others to please them and that they would vote for it because the country was in dire straights and needed immediate help. Instead of playing politics, several Republican governors should have gladly taken all of the stimulus money for infrastructure, schools, health care etc because that directly helped their own constituents. Instead of acting like know- it -all bullies and saying NO to everything, they could have seemed more concerned about the good of the country. They should not have punished those Senators who voted their conscience and for what they felt was best for their constinuents. They should admit that their grandchildren were already going to shoulder a huge debt for many years caused by the huge Iraq war debt. At least this administration's debt is going back into your own country. They should have told people like Limbaugh, Coulter, Beck, Dodds, McConnell, Boehner,Gullianni, Hannity, Romney, Gingrrich, Cheney, etc. to control their anger and refrain from the hateful, bitter rhetoric because that is now how they are being labelled and remembered. There are tons of video clips of their rants and displays of arrogance that prove how intolerant they are. They missed a perfect chance to act as team players and help your country NOW and then in a year or so when the country is back on track, then they could start their political posturing at a more approprtate time.. This was not the time to play politics. They missed the boat. as long as there are people like Romney, and other people that listen to that type of self-serving bs, the American people will always be an afterthought. And the word for today is...They were calling the Democrats radicals and socialists during the election...and now suddenly they are monarchists. Me thinks someone got a new dictionary. I live around libs like Steve from Somerset in an ultra blue area. His lib lying is just norm for them, libs like that have been dishonest and immoral their whole lives. It is not just their politcs, its the libness on the highways, using their car as a weapon, their 10 year old kids swearing and being violent ETC. If you are not like this then join the party of personal responsibility, class, respect, and integrity. For fun research all of any lib's lies, see how dishonest they are. Then take the most extremist right winger you can and reserch what they say. Even Coulter, Rush, and Hannity are more honest, fair and respectful than any Democrat in America today, amazing but true, see for yourself! People keelp complaining about higher taxes, but the plan has been to go back to the tax level during the Clinton administration for people making more than $250,000 and cut taxes for those making less. when you look at how much we tax compared to other contries we are not taxed that much at all. We also do not get the services from the government that other countries get as well. Call them socialist but they are providing services for our money. That to me is more of an investment that is need as opposed to war spending that has little return of investment. If the GOP will just stop distorting facts and good ideas with smear than I will start listening to them. Right now it's smear, smoke, and no good ideas. Romney said ""We are the party of the revolutionaries, they [Democrats] are the party of the monarchists." expressing the essence of all." Hey Mitt – stop staring at the rock in your hat, it's softening your brain!Calling dems "monarchists" is the dumbest thing you've said since you quit the prez race! And the republicants you're saying it to have got to be equally as stupid for accepting it from you. It does seem , reading these comments, that the people of America have had their fill of the Republican Party. I wonder if it would be of any use to forward these comments to the Chair of the RNC. Probably not! Just an idea I thought might help them in their new, "grass root efforts, from the bottom up " Then I remembered that that approach was used before, and I don´t think the Republicans want to be copy cats... Oh well, I guess they will find their way sometime in the future. At last..... The ivory tower of white supremacy is finally coming down. I am so happy. Not to offend, but this is destined to happen. The founding fathers of this beautiful country knew it, past presidents knew it,the KKK knew and knows it,and quiet as it's kept, Rush Limbaugh, Hannity,Coulter, (and the rest ...here on Racist Island) knows it as well(You can tell by their actions and words). This is not just a white man's world anymore. This is a world for the black, brown, red, yellow,and white. The Republican Party went from Prime Rib to taco meat. Thank you also CNN for positve and in-depth news. Looks like a good start. If Republicans can abolish their message of hate, they will do just fine in 2010.
snake oil media t.v. tabloid personality isnt really helping the repub. AND pray tell, whose fault is it that the GOP has taken "licks" as Romney says. Who is responsible for our good pay benefit jobs going overseas. Who is responsible for the failure of banks allowed to roam unchecked. Who was responsible for the lack of response to the Katrina disaster. Who was responsible for the failing to find the anthrax killer who targeted democrats and liberal leaning newspapers. THE GOP THAT'S WHO. And why should any normal, red blooded true American want that type of party to take control again. Darn we wouldn't have country left if republicans get them hands on it again. "You can put lipstick on a pig, but its still a pig"
The tendancy for the Republicans to harden up over on the right will only further isolate them. They can paint themselves into a corner but it will only mean more defections from moderates. Hey Mitt, who is the revolutionaries? Who was in office when things went south on Wall St. and in the housing sector? I heard an observation once that; " A conservative is someone who believes that nothing should be tried for the first time." A fitting description for the party of NO. Same old, same old. Take off the tie. Sell a couple of your vacation homes (Romeny has been selling some of his mansions). Start slummin' it in the 'burbs. East some pizza. And if the idiots actually fall for it again, resume where you left off: waging war against the middle class and the poor. Carve up everything good about America and sell it off to the highest bidder. How do they change when the party is firmly in the hands of a bunch of brownshirts? Tom Delay and Newt Gingrich were openly trying to install a permanent majority in congress. That is the thinking of a Monarch. That is the thinking of an authoritarian. That is the thinking of a Nazi. Dont be so sure your beliefs are the right ones. Times change and so should the agenda. You can talways fight for lower taxes when taxes are the lowest they have been in modern history. If you truly want to reduce the size of govt, realize what thet will take. You have to reduce the amount of people requiring govt assistance. Educate the people and fix health care!!! You can not just stop the govt. You have to reduce the need for it. If you truly want to reduce the size of govt. Reduce the need for it. If no one has told you currently we need a big govt. The republicans don't have an image problem. They have a substance problem. I hope they realize this. They need to return to the Reaganesque principles and policies which made them the majority party in the first place. If they think they can just hold a few public events and keep pandering and spending like democrats, they are going to be disappointed. I think these are the same people who were calling for all the corporations to file for bankruptcy. Hmmmmm not a bad idea..
@Keith: I'm amazed at how short sighted and reactionary our politics have become. The republican party has problems that are a function of the political cycle we happen to be in right now. There will be a Republican in the white house ,they will control one of the two bodies of congress within a decade.So let the democrats have there day in the sun and remember that nothing in life or politics is permanent. I think you're forgetting one very important difference. THE DEMOGRAPHICS HAVE CHANGED. Women, young people-white and black, Hispanics, Asians, etc. are rejecting the GOP. Unless they become more accepting to those groups (a cold day in hell), I say the GOP is doomed. mitt you are clueless ! main stream america spoke november 4 2008 when WE elected Barack Obama as President.